Huawei Philippines has just announced the price of the Huawei Y6 2018. And surprise, surprise, it’s actually lower than we had anticipated. Launched just several days ago, Huawei’s budget smartphone with a trendy 18:9 display and quad-core internals will be priced at a reasonable P5,990 (roughly $115) when it arrives in offline stores on April 28. Even better, there’s a P500 ($10) discount if you buy it from Lazada Philippines between April 25 and 27, bringing the price down to P5,490 ($105). You can get the phone in black and blue paint jobs. If we had to choose, we’d grab the latter, if only to break the monotony of owning a black slab of plastic. The Huawei Y6 2018 will be priced at a reasonable P5,990 (roughly $115) when it arrives in offline stores on April 28. Even better, there’s a P500 ($10) discount if you buy it from Lazada Philippines between April 25 and 27. For context, recall that the Xiaomi Redmi 5A — arguably the current standard in the bargain basement — retails at P4,390 ($84) in the Philippines. It’s cheaper, sure, but it’s also rocking a smaller 16:9 display and a generation-old Android Nougat-based OS. And if looks matter a whole lot to you, know that the Redmi 5A is at a disadvantage in the aesthetics department. For context, the Xiaomi Redmi 5A retails at P4,390 ($84). It’s cheaper, but it’s rocking a smaller 16:9 display and a generation-old Android Nougat-based OS. It’s also at a disadvantage in the aesthetics department. 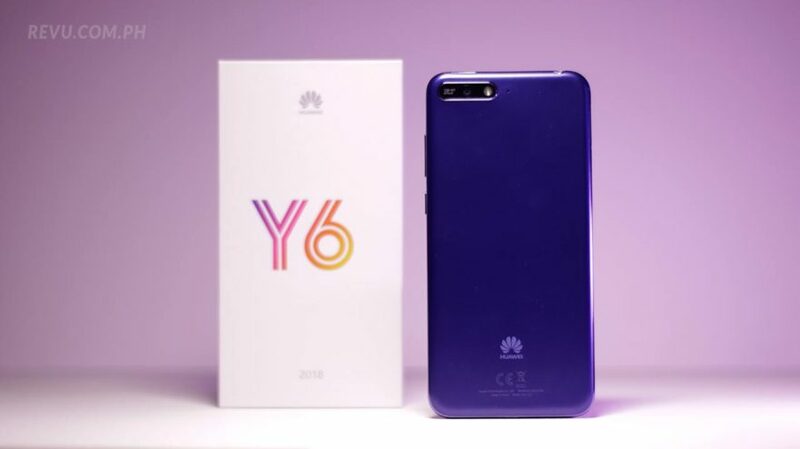 In the other corner, you have the Huawei Y6 2018. The front features a 5.7-inch high-resolution display with 1,440 x 720 pixels, resulting in a taller aspect ratio that we keep telling everyone is great for content and gaming. The single cameras on the front and back are 5 and 13 megapixels, respectively. The front-facing camera touts selfie-toning flash that automatically detects the lighting on your face and adjusts the level of brightness in your shot accordingly. You can also unlock the phone using the front-facer in lieu of fingerprint verification, which the Y6 2018 is missing. Huawei had to make compromises to get the phone’s price comparatively low, after all. Completing the package, you’ll find a Qualcomm Snapdragon 425 processor with 2GB of RAM and 16GB of expandable storage inside; Huawei’s custom UI based on Android 8.0 Oreo; and a 3,000mAh battery. As we mentioned earlier, we’re currently putting the Huawei Y6 2018 through its paces, so be sure to wait for our full review. In the meantime, what do you think about Huawei’s aggressive pricing strategy lately? Do let us know what you think in the comments below.